Electric vehicles (EVs) are leaving a footprint in the automotive industry with consumers acknowledging improvements not only in vehicle design but also convenience. With more public charging stations spread all over the country, EVs appear to be a trendy choice for those consumers who are constantly concerned about fuel efficiency, climate change, clean energy, and other vehicle-related features. A decade ago you were probably skeptical about the adoption of these vehicles with plugs. But, evadoption.com – a research site and advocate of EVs and their adoption – has found that EVs are becoming increasingly popular, predicting a greater outcome in the upcoming years. Of course, their research gathered a lot of data describing different market and car manufacturing trends, following a year-to-year comparison to indicate patterns in product innovation and consumer choice. Whether you are evaluating or planning on purchasing an EV, eTags has created an infographic that compiles the top-selling EVs sold in the US from the above-mentioned study. 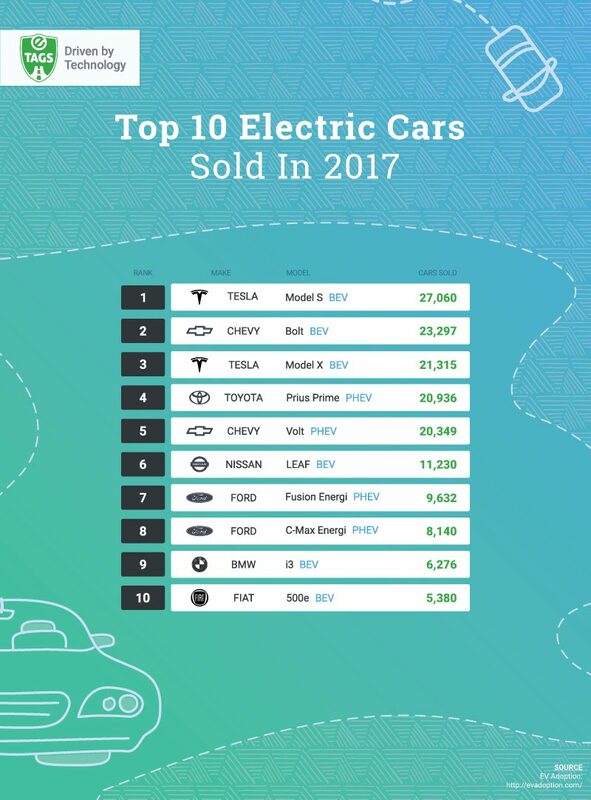 Note that this infographic covers a top 10 list of electric cars classified by make and model for 2017. Scroll down and check if your favorite EV ranks on the list. It’s worth pointing out that 2017 was a prominent year for EVs in the US since sales have seen a solid growth over a decade. Drilling down on the infographics, we find Tesla S leading the ranking with 27,060 units for 2017. Even though the numbers are skyrocketing for Tesla, sales declined slightly compared to its performance from previous years. A well-deserving runner-up, Chevrolet Bolt, has made an successful impact compared to other vehicle brands in the industry. With 23,297 units sold, the Chevy has seen an escalating growth rate in 2017 compared to other previous annual reports. Field experts predict that this positive trend will continue during 2018 since sales units increased from month to month. It also appears that the Toyota Prius Prime has been realizing growth by positioning their brand as one of the most favorite vehicles in the country. The Japanese car manufacturer has sold 20,936 versions of this model in 2017, placing this model as one of the best vehicles whose sales growth has seen a dramatic growth compared to previous years. Both, Chevrolet Bolt and Toyota Prime Prius, could categorically confirm that 2017 was a year worth remembering for their books. 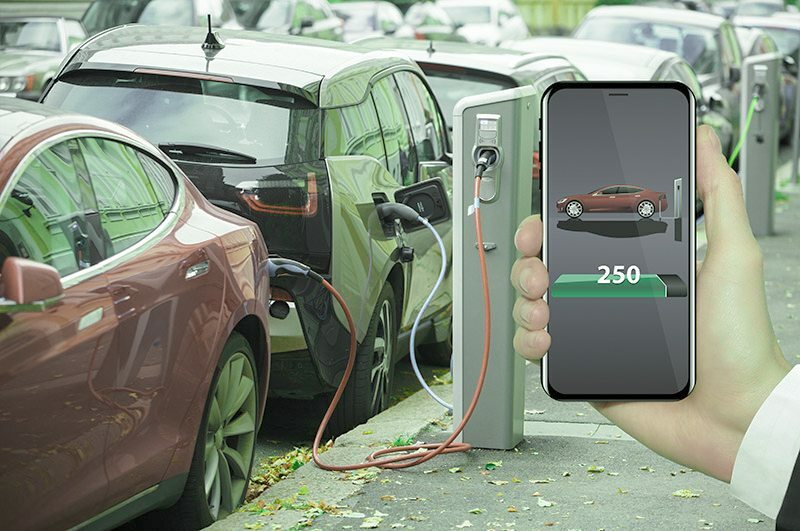 It doesn’t matter what type of electric car you are more prone to shell your bucks into, the fact is that EVs are making an impact on the automotive industry and they are here to stay. I wonder what the average time period it takes to pay off the car and start saving money on gas? Good question, Ann. It all depends on the vehicle that you purchased. There’s a lot of misconceptions about EVs that are also worth debunking.